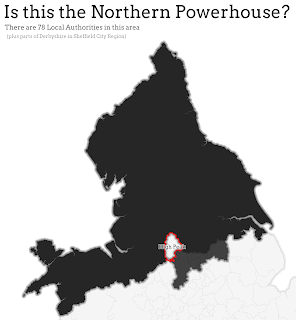 Stats, Maps n Pix: Where is the Northern Powerhouse? Where is the Northern Powerhouse? Depending upon how you look at it or who you've been listening to, the 'Northern Powerhouse' is a 'programme', a 'proposal', an 'idea', an 'area', a 'thing' or - for some - a bit of a dog's breakfast. It's definitely something, but where is it? That's what I set to find out and this is my attempt to understand it. First things first though. 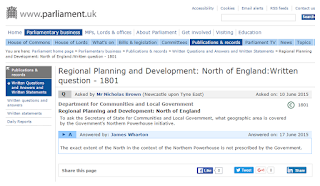 The government officially don't define its area, as you can see from the Hansard extract below that says 'The exact extent of the North in the context of the Northern Powerhouse is not prescribed by the Government'. So, obviously it's just the north of England, right? Wrong. Look at the gif below and see if you spot anywhere that isn't in England. Okay, so North Wales is in and that makes sense. The cross-border economic connections between Cheshire and Flintshire/Wrexham and beyond are very important and long-standing so shouldn't be ignored. Now it's time to look at some maps. I attempted to turn the list of areas above into a map, which you can see below. It's a pretty wide definition but of course there is value in not being too specific about what is in or out as you can then be a bit flexible about things round the edges. One example of this would be the parts of Sheffield City Region that are actually in Derbyshire so not in the areas listed in the gif above. But of course this looks pretty big and the Northern Powerhouse is often put into an English, urban context. So the next map adds urban areas into the mix. A third map adds in the parts of Sheffield City Region I just mentioned. As you can see, this then leaves High Peak encircled by the Northern Powerhouse but I don't think that is deliberate. Now with added Sheffield City Region areas - High Peak left out? What about connections? An important part of all this agglomeration and city productivity talk is how places connect together to help produce stronger economic growth. 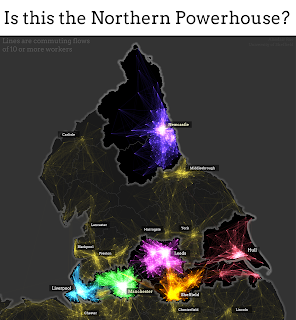 That's a big part of why much of the Northern Powerhouse work so far has centred on transport, and why they used my original flow lines map on the front of one of the reports. So I've also attempted to map those here again, in a more colourful way. The final map shows this. 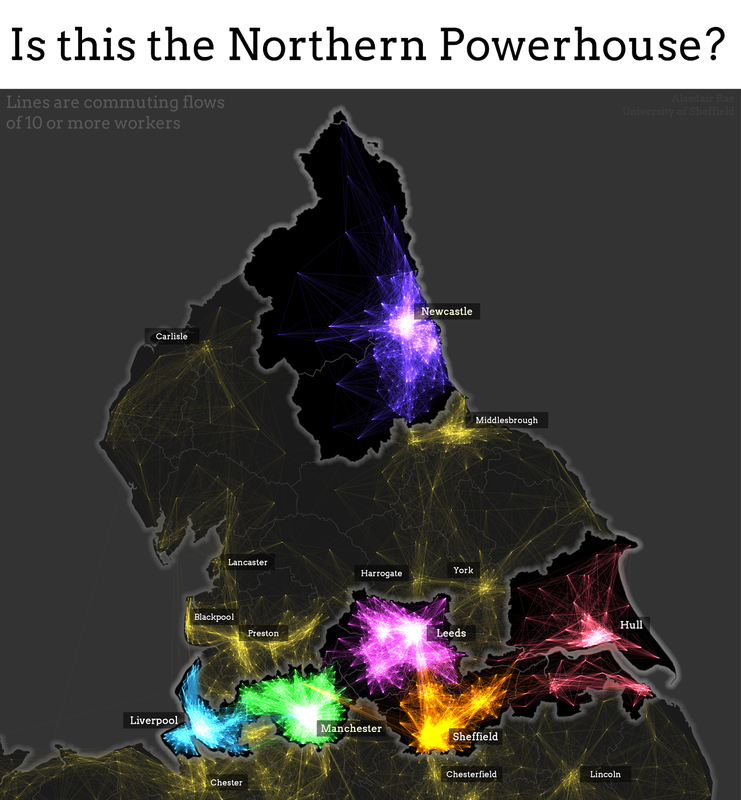 I've coloured some of the major urban areas differently and used darker shading for 36 local authorities that seem to me to be at the heart of the Northern Powerhouse idea. "Today we have the very welcome news that Abu Dhabi will be investing £1 billion in building new houses in Manchester. That is a step towards it becoming the northern powerhouse I want to see, and it is a £1 billion vote of confidence in our long-term economic plan." 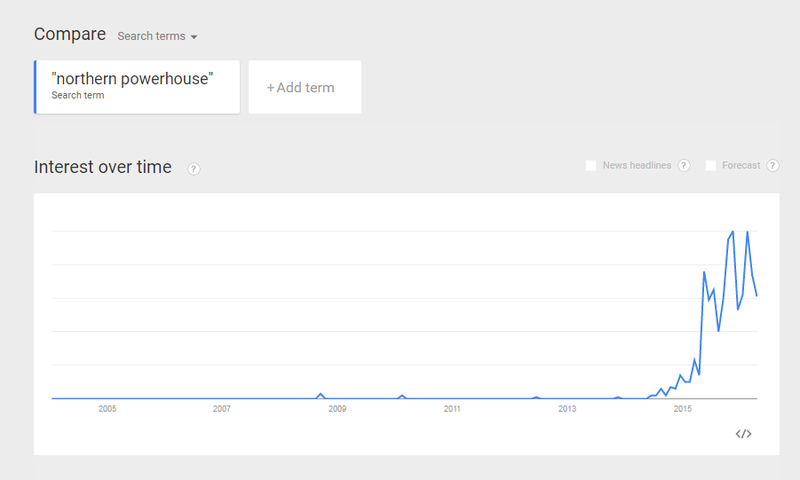 Not exactly lightning bolt stuff then. But I feel like I now know a bit more, which is always a good thing. 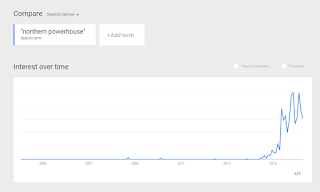 Anyway, it seems that we might already have hit Peak Powerhouse. Notes: Neil Lee at the LSE has written a good policy paper on the Northern Powerhouse that's well worth a read. Anyone with a decent memory will remember the previous incarnation of this, in Northern Way form, still available in small part online as archived content. I tweeted a version of the last map earlier in the week so I'm wrapping it up here, after a bit of further thinking and to and fro with Buzzfeed star Peter Matthews and expat Westphalian/north west near-native and spatial planning guru Andreas SchulzeBäing. 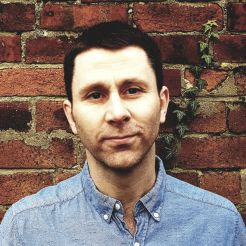 If you're really keen, go back and read the original Northern Way stuff from 2004. It's still available via the waybackmachine internet archive.